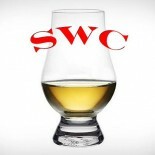 Here’s another obligatory review of a widely available whiskey from a worldwide brand. Can’t ignore this one, even if we are frightened of what’s in the bottle. Nose – Very young, perfumy, lightly sweet, grainy and simple. Taste – Light, some honey sweetness, pretty boring. Finish – Faint smoke. Short, grainy and fading. Comment – Bland, too young, lacking character. Forgettable.